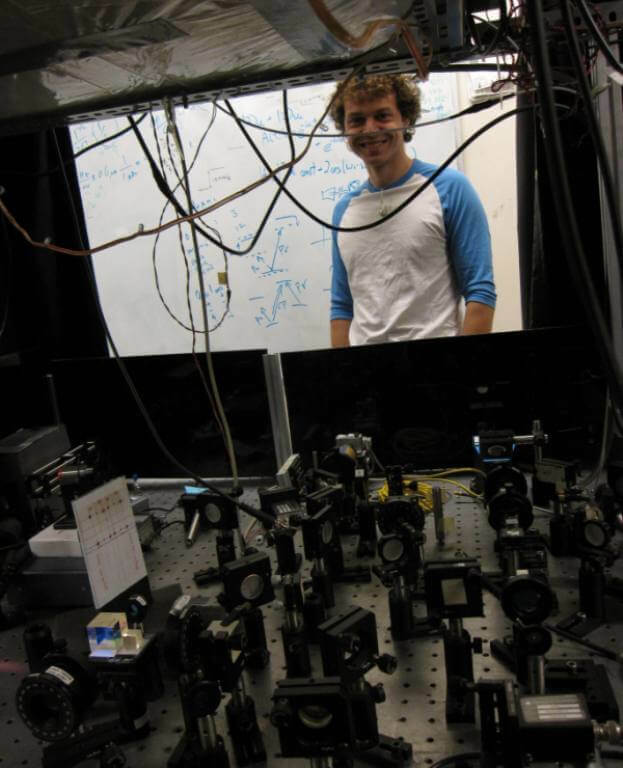 I’m psyched to present a new Pop Physics feature: Interview With A Physicist! We’ll be speaking to people working in all kinds of physics-related fields to get a better sense of what it’s actually like to spend your days probing reality’s deeper mysteries. Dmochowski in front of his group's experimental setup. Pop Physics: What are you working on right now? We are trying to make two beams of light interact with each other. “Interact” really just means that we want some noticeable effect to appear on one beam as a result of the other beam. Normally, light doesn’t interact with other light; two beams just pass through each other completely unaffected. But light talks a great deal with atoms. By looking at light after it’s passed through an atom, you can infer information about what state the atom was in. Equally importantly, the state of the atom can in turn be affected by the interaction with light – the interaction goes both ways. So the basic idea is this: you have two light beams (lasers) and some atoms. You shine one of the lasers at the atoms and then measure this light after the interaction with these atoms. This first laser beam will be called the ‘probe’ beam. When you measure the probe beam, you will be able to infer something about the state of the atoms – how many atoms there were in the ground state, for example. Now, while leaving this probe beam on and continuously measuring it, you then shine the second laser beam (the ‘pump’ beam) through the atoms. This pump laser will affect the atoms – transfer some of them into the excited state, for example. As a result, the original probe laser that you are measuring will feel this change in the number of excited atoms, and your probe measurement will indicate this. In effect, the pump beam has interacted with the probe beam, using the atoms as a mediator of the interaction. Strictly speaking, the two laser beams haven’t interacted with each other. But they have both interacted with the atoms in such a way as to be able to infer the presence of the pump beam just by measuring the probe beam.